It’s spring! I am so excited! My mint is growing like crazy! I love having it fresh just outside of my door instead of having to buy it at the grocery! This is the recipe I make all of the time for my salad dressing. My husband’s mom’s family is Lebanese so they make the best middle eastern food. This recipe is not exact, so you can’t mess up! So I am just guessing on the amounts, it really doesn’t matter, just make to taste! Mint (fresh is best! )-guessing 1/4 cup or more? If you have a wooden bowl, it is best, but not essential. In the bowl, take the mint, salt and garlic and grind to a paste, using a pestle. Then squeeze the lemon juice into the mixture. Add Olive Oil and then grind pepper over it. Then cut up tomatoes, throw them in there, then add the lettuce. It’s that easy! Enjoy! This makes enough for a whole bag of lettuce (Ok, you purists don’t have to use bagged lettuce! I am just telling you about how much it will cover). Thank you for posting this – i made a fantastic dressing and had it with lamb and a salad! Thanks for writing in, so glad you liked it! We make it all the time, so easy and fresh! 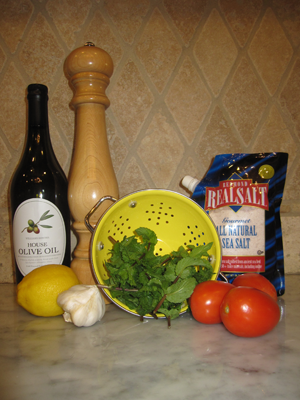 I will be posting recipes from time to time, I just posted my Basil Pesto recipe today! Question, what kind of mint? I went to Home Depot to buy a mint plant and there were 3 different kinds lol. Spearmint, peppermint, and sweet mint. I don’t want to buy the wrong one. Please help lol. Thanx in advance!